The vehicle that will make Britain’s next attempt on the world land speed record has been revealed today in London. East Wintergarden in Canary Wharf was the venue for the grand reveal of Bloodhound SSC, the world’s fastest and most advanced vehicle that is the product of 8 years of research, design and manufacturing involving over 350 companies and universities. 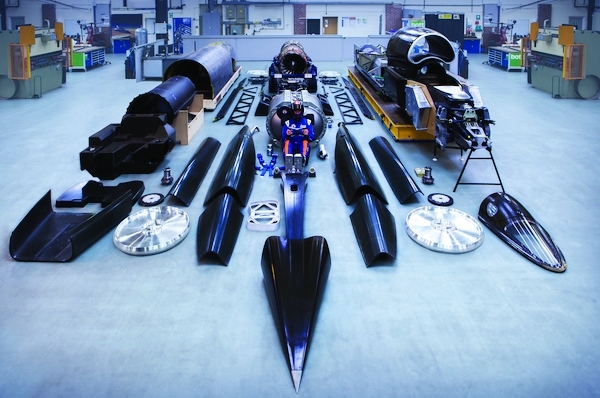 The car is the star of a free, two-day exhibition that has 8,000 confirmed visitor registrations who will be among the first to see the completed 13.5m streamliner, which uses jet and rocket motors to produce c.135,000 thrust hp to make Bloodhound the worlds’ powerful land vehicle. The Bloodhound Project, the team behind the vehicle, say Bloodhound SSC is being shown in record attempt configuration, with its 2m high tail fin in place for the first time. Carbon fibre panels have been partially removed on one side in order to show the technology inside the car, including the Rolls-Royce EJ200 jet engine and supercharged Jaguar V8 engine used to pump oxidizer into the Nammo rocket. Visitors this weekend will be invited to look inside the finished cockpit, which is a complex monocoque made from multiple layers of carbon fibre that houses a sophisticated digital dashboard, designed by the driver Andy Green, as well as manual back-ups for the major controls. The Bloodhound team explained that this level of redundancy would help reach its goal of 1,000mph safely, which is a key element of the vehicle’s design and why the vehicle has three separate braking systems, seven fire extinguishers and 500 sensors so engineers will know exactly how it is performing during each high speed run. Castrol is providing a number of lubricants including a specially blended engine oil, strengthened with their Titanium Fluid Strength Technology. Bespoke Rolex instruments provide another layer of redundancy: should the digital read-outs fail, Green will use these clocks to time the release of the car’s parachutes and when to apply the wheel brakes. If he brings them in too soon, at speeds above 250mph, for example, they could burst into flames. The car has been created by a team of Formula 1 and aerospace experts with assistance from the Army’s Royal Electrical and Mechanical Engineers and technicians from the RAFs 71 Squadron who built the tail fin. Bloodhound SSC also has 12 cameras built into it, including two inside the cockpit that will be live for the first time during the public show. When the team is racing for its first record next year in South Africa, audiences will experience the same view as Green and see the same information. They will know how the car is balanced, the temperatures in the engines, the speed through the measured mile. Sharing the experience in this way, and all the data coming from the car, is a core principle of The Bloodhound Project and central to its mission of inspiring a future generation about science, technology, engineering and mathematics. The difference in the positive attitude, ingenuity and sheer determination of the Bloodhound team is in stark contrast to the great Chinese sell out that George Osbourne is currently untertaking, with our money and in our name. We need more Great British Engineers and less useless, here today gone tomorrow politicians. Er, I think they’re mis-guided. Quite what you mean by “sell out” is beyond me considering the amount of Jaguar, Range Rover, Bentley, McLaren and Aston Martin cars that are bought in China, not to mention of course the Rolls Royce Trent engines they’ve ordered in addiition to the ARM chips, Genus’s pig sperm, big pharma ……………….. I could compile an endless list for you. You’d prefer our UK promoting Chancellor to do what in what sectors? The only thing the Chancellor seems to be selling to the Chinese is lucrative (public backed) contracts for our infrastructure projects on which they will take a handsome profit that could have gone to British companies. Please refer to the stories about Nuclear Powers stations and HS2. As well as the above goods we should be selling nuclear power stations and railways to the chinese not the others way round. We already buy plenty from them, we have a massive balance of trades deficit with China! Mike, and that’s so much worse than Gormless Gordon’s PFI “Investments”, I suppose? The last PM to sanction any proper infrastructure investment in the UK was Margaret Thatcher. – and can we please stop talking about it as the 1000mph car – this deliverable was quietly dropped years ago! They started by promising 1000mph in 2012 – Now 2016’s stated objective is “just” to break the land speed record – 800mph may happen, 1000mph will NOT! And whilst the car still gets headlines, there are disappointed and disillusioned investors/ sponsors/ contributors from the last decade whose payback day is still more than a year away. Either or both of the initial “planning” or the subsequent execution seem to have been sadly lacking in competence.